The Sustainable Development Goals (SDGs) embody a universally shared vision of progress towards a safe, just and sustainable space for all human beings. 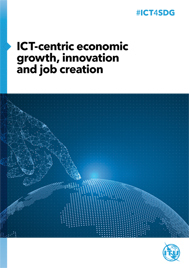 The book, "ICT-centric economic growth, innovation and job creation", written by leading scholars and experts from around the world, aims to address the challenges and opportunities offered by ICTs in the areas of innovation, governance, education, job creation and economic growth. The book was launched at a Ministerial Roundtable on ICT4SDGs organized to celebrate the 25th Anniversary of the ITU Telecommunication Development Sector (ITU-D) on 11 October 2017 in Buenos Aires, Argentina. See a short introductory video on this ITU Publication from this link and order your hard-copies, now available, below.